When I first visited this church and wrote about it in 2002, I observed that it was a great tribute to County Council planning policy that this little church can seem so lonely and isolated, despite the fact that the thirty thousand houses of the housing estates of south-west Ipswich are barely a mile away, and the great A12 rift valley lies half a mile to the west. Here, in high summer, the birds boil out of this glorious sanctuary of a churchyard, and in winter you could be in any century. Part of its remoteness is because the village itself is a good half mile away, and there can't be many places so close to Ipswich that it is still possible to spend an hour without seeing another human being. What I hadn't foreseen when I visited last was that this was a church community in its last days, pretty much. Congregations had fallen into single figures, and urgent repairs were going to cost an impossible amount of money. In March 2005, I received a poignant e-mail from a resident of Belstead, Ken Windsor. Dear Mr Knott, he began, I live in Belstead and have just heard that Belstead Church is to be declared redundant. Sadly this seems inevitable with a tiny ageing congregation, although many of us in the village though not church goers support the church financially and attend very occasionally. At next Wednesdays meeting, I should like, with your permission, to distribute copies of your web page for the church because it says so clearly why Belstead church is important and deserves support. I have no idea what redundancy involves but hope that the church will remain available for christenings, weddings and funerals with perhaps occasional services, no doubt all will be revealed on Wednesday. To put this in the context of the time, the north Suffolk parish of Redgrave had just controversially declared its huge church redundant, in the safe knowledge that it would be taken on by the Churches Conservation Trust. Technically speaking, they were very wrong to do this - the CCT exists to take on redundant churches that no one else can care for as a last resort, but it will only take on those which the Church of England asks it to, and these will only be those important ones which have already been declared redundant. Redgrave parish had fiddled the sytem somewhat, although it would certainly turn out to be a happy outcome for their church, and as Ken's e-mail suggested, the event had generated a frisson of interest among other parishes facing difficulty. But redundancy and the CCT cannot be seen as an easy way of getting out of repair bills. I told Ken that if Belstead church was declared redundant, there were three possible outcomes. If the CCT took the church on, and this was by no means certain, it would save the building and enable possible future use, but under very strict conditions. Another route would be for a local trust to take the building on, as at Southolt and Darmsden - this outcome particularly suits smaller churches of less historical importance than Belstead, and enables much more freedom about further use. 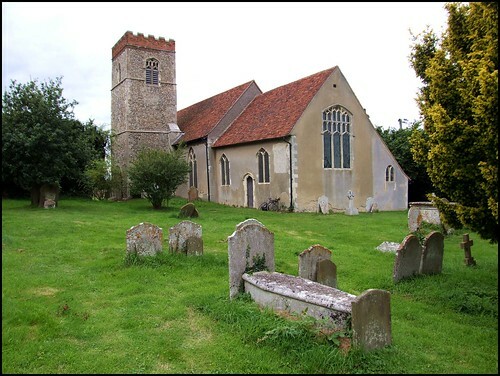 A third, terrifying possibility is that the church would become derelict from neglect, until the Diocese lost patience and sold the building for conversion into a private house, as had occured at a dozen or so churches in Suffolk. Well, as so often happens, the sheer threat of losing their church galvanised the people of Belstead. Great local interest was generated, and the flat-lining heartbeat of the parish church was jump-started back into life. Because of so many people getting involved, the church was not declared redundant. I suspect that having someone like Ken among them helped. The amount required for repairs turned out to have been over-estimated, and work parties set to clearing the graveyard of overgrowth and cleaning out the inside of the church. In October 2006, Ken could report to me that the village rallied, and we have been able to reverse the decline and run monthly services that attract around 30  up to 50 on high days and holidays. Its an encouraging start. It was with delight that I now noted that Ken, this energetic catalyst who had told me that many of us in the village though not church goers support the church, was now, in fact, the churchwarden! I came here again in the hit-and-miss summer of 2008. It was a pleasant enough day, and I was nearing the end of a tour of the Shotley Peninsula. I decided to call in at Belstead church on my way back into Ipswich, and cycled out of the village on the road towards Copdock. Soon, the pretty and familiar red brick-topped tower rose above the barley fields. I turned the corner, and hauled my bike off up the verge. The view from the road is lovely. As many do around here, St Mary has a tower to the south of the nave, and the porch is beneath it. While I was contemplating it, I heard a large vehicle brake sharply behind me. I turned to see a smiling man get out of a hastily parked van. If this was a novel, it would seem most unrealistic to tell you that it was my erstwhile correspondent Ken Windsor, but in fact this is exactly who it turned out to be. He was excited that I had come back to Belstead, and I was pleased to meet this man who had led the salvation of the building, and so we briefly formed a mutual admiration society before he led me up the path and into the church. In 2002 I had described stepping into a gorgeously unkempt interior; the decorators have been kept at bay here for many a long year, and the smell of damp is the same one that our ancestors experienced. On reflection, this vicarious enjoyment of neglect seems rather unfortunate, and so it is with pleasure that I can report the church now feels thoroughly loved, looked after and cared for. St Mary is one of the most interesting of all the outer-suburban Ipswich churches, simply because it has more medieval and early-modern survivals than any other. Pride of place goes to the roodscreen dado, despite the fact that it is terribly badly mutilated. William Dowsing came here on January 29th, 1644. It was a Monday morning, and Dowsing was setting to work that day on the Ipswich churches. He had already visited Chattisham, Copdock and Washbrook that morning, and this day would see visits to a record eleven churches. He found much to do at Copdock and Washbrook, and didn't skimp here either, finding idolatrous images in stained glass, and brass inscriptions to melt down. The rood screen doesn't seem to have caught his attention - but then, none in all Suffolk did. Perhaps it was painted over, or maybe the vicious scratching out of the faces by the Anglicans a century earlier seemed enough hatred to unleash. The panel figures are arranged so that female Saints are on the north side, and male Saints on the south side. Several panels are almost completely obscured as a result of the Anglican vandalism of the 1540s, but they include St Sitha with her bunch of keys, St Ursula holding a ship and an arrow, a female figure who is probably St Margaret, two Bishops, St Lawrence with his grid iron, St Stephen holding stones, St Edmund in royal robes with an arrow and St Hubert with his bow - I had previously identified this last figure as St Sebastian, but I am pretty sure now that it is St Hubert. Interestingly, three of these figures are shown holding arrows. Just to the south of the screen is a fine-looking old piscina in the south wall of the nave. It looks as if it is melting, and it probably served an altar which was here before the rood screen was built. The only surviving brass (because of Dowsing, we know that there were once others) lies in front of the screen. Back in 2002, it was covered in perspex, obstensibly to protect it, but of course the damp was collecting beneath it. Now, it is free and able to breathe, and is very beautiful. It is to John Goldingham and his two wives (not at the same time, silly) and dates from about 1520, the eve of the Reformation. It is a fine survival, and deserves to be better known. The north aisle is a curiosity, because although the windows in it have medieval tracery, the arcade which separates it from nave and chancel is clearly Victorian. The north chancel chapel is a delight, home to a some gorgeously sentimental 17th century memorials. The best is by John Stone, and it is to Elizabeth Blosse. She died during the Commonwealth, and the tablet shows her three sons, and four daughters, kneeling in puritan piety over a prayer desk. It goes some way to compensate for the smashed stained glass and melted-down brasses which she was no doubt partly responsible for. Other memorials are to Tobias Blosse, her father-in-law, and some austere memorials of a century later. I had found this aisle full of clutter six years previously, but the enthusiastic parishioners of Belstead had worked hard to bring it back to order. There is a modern yet rustic roof to the nave, constructed by a local firm in the 1930s. Roy Tricker notes in the church guide that the great Munro Cautley, at that time Diocesan architect, submitted an ambitious plan for a double hammer beam roof, and then went off in a huff when his plans were rejected. It was all very pleasing, to come back to this church and find it such a success story. I looked around for the visitors book, but couldn't find it. Ken thought for a moment, and then remembered seeing one on a shelf in the vestry. He went and got it, a thick, hard-backed volume bound in green cloth, with those swirly patterns on the end papers. We leafed back through it, looking at entries going back into the 1920s. It was poignant to read the messages written in at the end of the Second World War. The last entry in the book had been long ago, back in 1961, a few weeks after I'd been born. It felt a kind of honour to add mine underneath it. And then, back on my bike, over the great rift valley to Copdock, a few minutes away.